ALLEGRA BOVERMAN/Staff photo. Gloucester Daily Times. Gloucester: The Cape Ann Vernal Pond Team paid a visit to Beeman Elementary School on Friday afternoon and brought many snakes with them to demonstrate and talk about with the students and staff. 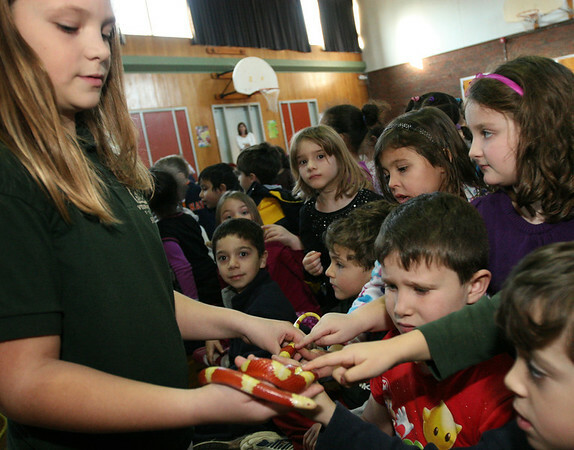 Kate Bevins, a fourth grader who volunteers with the team, left, shows students an albino milk snake. Finley Sweeney, a kindergartner, second from right, bottom, wasn't so sure what he thought of the snake.